Ken Berman, a University of Michigan graduate, is the founder and CEO of GorillaTrades Inc. 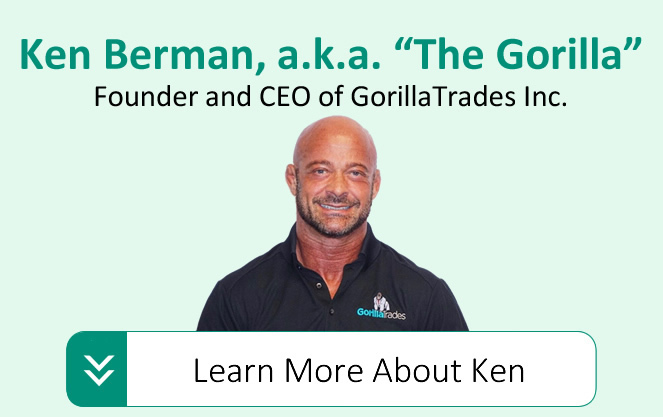 Since the company was founded in 1999, Ken Berman has been known only as "the Gorilla." However, in recent years, Ken has been more outspoken about his acclaimed service and its abilities to help investors of all experience levels make better-informed decisions in the market. Ken took an interest in the stock market at a very young age, taking over his father's investment accounts in his early teens, and eventually began focusing more on momentum and swing trading. Ken was met with early success, trading then-fledgling biotech stocks like Amgen (AMGN), Biogen (BIIB), and Immunex (later acquired by Amgen- AMGN), among others. Prior to founding GorillaTrades, Ken was Vice President of Investments at both Smith Barney and PaineWebber, with more than $100 million under management. It wasn't until the late 1990's that Ken began considering formalizing his trading method and offering it as a service to the general public. In the 18 months prior to founding the GorillaTrades service, Ken utilized the GorillaTrades system to turn $250,000 of his personal savings into a very impressive $5,500,000! After successfully implementing his trading system and realizing the stellar returns, he knew he was on to something. Thus, the GorillaTrades service was born. Ken took a small internet-based company that was initially housed on a laptop computer in his nephew's dorm room at Boston University, and has grown the company to be one of the most highly-respected stock-picking services in the world! Since 1999, Ken has been providing top-notch investment advice through the GorillaTrades service to thousands of investors in over 55 countries. And in recent years, Ken has also been asked to share his financial wisdom with other prestigious publications such as Forbes and Kiplinger.